FOR A LONG time, China has been a dumping ground for the world’s problematic plastics. In the 1990s, Chinese markets saw that discarded plastic could be profitably recreated into exportable bits and bobs—and it was less expensive for international cities to send their waste to China than to deal with it themselves. China got cheap plastic and the exporting countries go rid of their trash. But in November 2017, China said enough. The country closed its doors to contaminated plastic, leaving the exports to be absorbed by neighboring countries like Vietnam, South Korea, and Thailand. And without the infrastructure to absorb all the waste that China is rejecting, the plastics are piling up. Between now and 2030, 111 million metric tons of trash—straws, bags, water bottles—will have nowhere to go, according to a paper published in Science Advances on Wednesday. That’s as if every human on Earth contributed a quarter of their body mass in mostly single-use plastic polymers to a massive, abandoned pile of garbage. While it is China’s new policy that will lead to this precipitous increase, the buildup isn’t exactly its fault. “China has been importing plastic waste for the last 28 years,” says Amy Brooks, a materials science graduate student at the University of Georgia and the lead author on the study. “And so after awhile, they realized that the world was depending on them to manage their waste.” China processed trash from 43 countries in addition to its own in 2016, and high-income countries are responsible for nearly 90 percent of plastic exports since 1988. The European Union was the top exporter, followed by North America and Japan. But there is a way out. 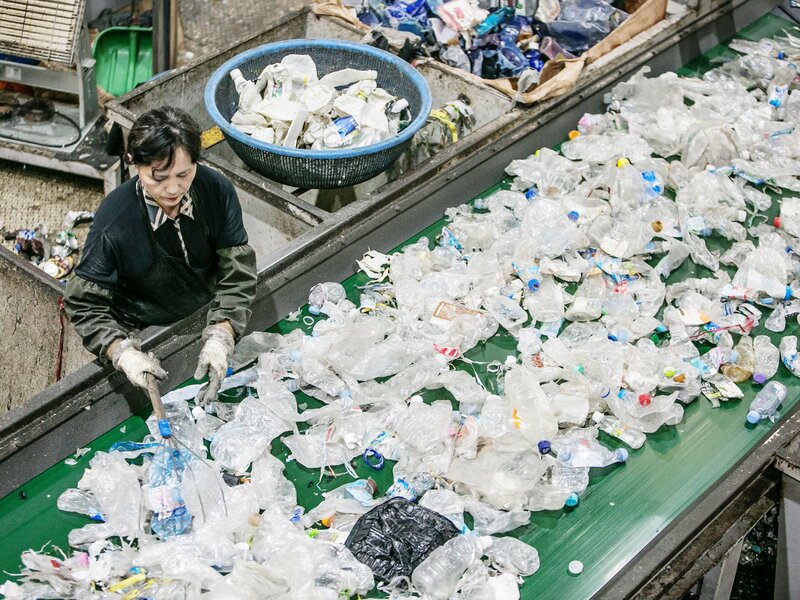 China isn’t turning away everyone’splastic—and in the loopholes, its former plastic partners may find a way to continue to recycle their waste overseas. Plastics are more difficult to recycle the more contamination they include. That pulp that you forgot to wash out of your orange juice bottle can gunk up machines and devalue the recycled product. Most plants still use hand-sorting, so workers can be exposed to diseases and sharp objects. So in 2013, China erected the “Green Fence,” a policy that set a hard restriction on the amount of contamination that plastics can contain. Last November its ban expanded to include all nonindustrial plastic waste—aka the stuff in the blue bins. There’s an exception, though. If bales of recycled plastic meet very strict requirements—currently less than 0.5 percent contamination—China will still allow them to enter the country. And San Francisco is exploiting that rule. Not all cities have the infrastructure and resources that San Francisco does, which means that China will continue turning trash away at the border. That leaves lots of stranded plastic, which ends up piling up in its countries of origin. It might be incinerated. It could be buried in a landfill. If the countries surrounding China can’t deal with the excess, the plastics might leak into the environment. That means more endocrine disruptors in the water and more pollutants in the ocean. Brooks says that she hopes the terrible options for the present plastic glut will help leaders plan better for future waste, or even eliminate it altogether. Her study found that about 90 percent of the traded plastics are single-use polymers, and she hopes that this data will encourage governments to put regulations in place to cut down on disposable plastics. “My dream would be that this is a big enough wake up call to drive international agreements,” she says. The ban has already caused the EU to consider a tax on throwaway plastics. Maybe more cities will step up to decontaminate their waste, like San Francisco. Or—imagine this—cut back on plastics altogether.